a serine protease coagulation factor present in normal plasma that activates factor XI in the presence of prekallikrein and high molecular weight kininogen. Factor XII is activated in vitro by contact with negatively charged surfaces, such as glass, kaolin, or ellagic acid. Deficiencies of XII do not cause clinical bleeding disorders, but may prolong laboratory coagulation tests. Also called Hageman factor. 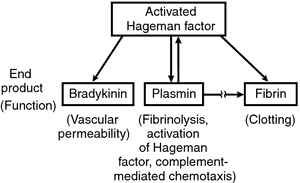 The factor that initiates the sequence of reactions that ends in blood clotting (coagulation). Also known as the Hageman factor. Activated factor XII levels and factor XII 46C>T genotype in relation to coronary artery calcification in patients with type 1 diabetes and healthy subjects. A common C-T polymorphism at nt 46 in the promoter region of coagulation factor XII is associated with decreased factor XII activity. Plasma levels of factor XII, prekallikrein and high molecular weight kininogen in normal blood donors and patients having suffered venous thrombosis. Association of the factor XII 46C>T polymorphism with risk of coronary heart disease (CHD) in the WOSCOPS study. Coagulation factor XII activity, activated factor XII, distribution of factor XII C46T gene polymorphism and coronary risk. Activated factor XII levels are dependent on factor XII 46C/T genotypes and factor XII zymogen levels, and are associated with vascular risk factors in patients and healthy subjects. Reevaluation of the incidence of thromboembolic complications in congenital factor XII deficiency -- a study on 73 subjects from 14 Swiss families. Epidemiological and genetic associations of activated factor XII concentration with factor VII activity, fibrinopeptide A concentration, and risk of coronary heart disease in men.